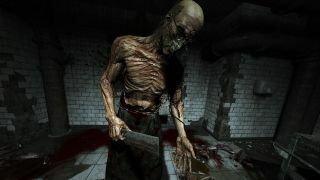 Outlast, from Montreal-based indie studio Red Barrels Games, was a pretty good horror game: Vaguely Amnesia-like at first blush but faster-paced and more overtly gruesome. It was successful enough to warrant a sequel, which Red Barrels confirmed last year is in development. So when I say the studio is teasing something on Twitter, it's not the conventional sort of "What could it be?" tease, but rather the promise of a proper reveal and, hopefully, a goodly portion of details. The tweet isn't the only thing hinting at action on the Outlast 2 front. The entire Red Barrels website is now just a grey page emblazoned with the studio's logo, an email link, and the words, "Coming soon... Things are going to get bloody!" Red Barrels hasn't revealed much about its plans for Outlast 2, although it did say when it announced the sequel that it won't be set in Mount Massive, the crumbling asylum that was home to the first game. More recently (as in, yesterday) it said on Twitter that it hoped to have it ready for release sometime in 2016.